Roberts also recommended that the eventual Democratic presidential nominee "needs to pick a white guy from a swing state, preferably a guy who owns a gun," a variation on her words from the Sunday May 11 This Week that the Democratic ticket should include a "Bible-thumping, gun-owning, white guy from a swing state." But what I do wonder, and people ask me that a lot, is whether, if she is defeated, that is going to set women back further, or whether the fact that she's made it this far is going to be helpful to women. And I fear that it will be the former because that tends to happen, you know. And the next day, everybody wakes up talking about the white male vote. Now, it was not her fault that they lost that election, you know. ... but I think it did set it back for a while. And I think that might be the same thing this time around, I'm sorry to say. Here is this woman who's worked hard, she's done it all the way you're supposed to do it, and then this cute young man comes in and says a bunch of sweet, you know, nothings, and pushes you out of the way. And a lot of women are looking at that and saying, "There goes my life." I think it would be very foolish for the Democratic Party to pick Barack Obama and Hillary Clinton as their ticket. They need somebody who's not a Senator from a state that's going to go Democratic anyway, which defines both of them. Either one of them needs to pick a white guy from a swing state, preferably a guy who owns a gun. [AUDIENCE LAUGHTER] And, I mean, seriously. I mean, that's what they need. That's where the problem is. Roberts also notably had complimentary words for Laura Bush, referring to herself as a "big fan" of the First Lady who is "one of the smartest people I know, and a genuine intellectual, which is something I would not say about myself." WOMAN IN AUDIENCE: I have often wondered about Laura Bush, and I guess the question would be: Do you know anything about her role or her thoughts? 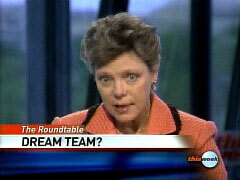 COKIE ROBERTS: Yes, I do, and I'm a big fan of Laura Bush. She is one of the smartest people I know, and a genuine intellectual, which is something I would not say about myself. And yesterday, I thought it was quite wonderful that she stood up, and she was the person holding the press conference about Burma because that is a cause that she knows more about than anybody else in the administration. And she finally just took to the lectern and did it herself instead of, sort of, feeding somebody else the information. And she has been highly influential in terms of literacy. The whole Festival of the Book, which happens now at the Library of Congress, was entirely her idea. And for a while, she was doing wonderful sort of symposia at the White House on American authors, and she had scholars of all different bents come in to talk about the American authors, and they were fascinating to listen to. Unfortunately, the scholars started using them as an opportunity to bash the President instead of talking about the authors, and so she stopped doing it. WOMAN IN AUDIENCE: I wonder if you could comment on what kind of legacy Hillary Clinton is beginning to form. Of course, her career is far from over, whether she becomes President or not, but there seem to be such opposing views to her. You know, people used to have, kind of, these gut reactions to her. And I wonder what, sort of, the sum will be if her political career were to stop at this moment, for example. ROBERTS: You know, what, I don't know, people do have very strong reactions to her, and I don't know how that is going to end up going down in history. People's attitudes toward her have shifted somewhat in the course of this campaign. And some people ended up liking her a lot more, and some people less. So we will see. But what I do wonder, and people ask me that a lot, is whether, if she is defeated, that is going to set women back further, or whether the fact that she's made it this far is going to be helpful to women. And I fear that it will be the former because that tends to happen, you know. You, I mean, Geraldine Ferraro was made Vice President, you know, to try to get the women's vote. Walter Mondale and Geraldine Ferraro lose 49 states. And the next day, everybody wakes up talking about the white male vote. Now, it was not her fault that they lost that election, you know. Vice Presidents don't matter. The only Vice President we can point to at all that has mattered is Lyndon Johnson by carrying Texas. And so I, you know, but I think it did set it back for a while. And I think that might be the same thing this time around, I'm sorry to say. MAN IN AUDIENCE: Geraldine Ferraro, as you say, didn't make much difference as vice presidential candidate. Were Barack Obama to become the candidate, as appears perhaps likely now, would Hillary Clinton be a Geraldine Ferraro? Or would she make a difference? ROBERTS: I think it would be very foolish for the Democratic Party to pick Barack Obama and Hillary Clinton as their ticket. They need somebody who's not a Senator from a state that's going to go Democratic anyway, which defines both of them. Either one of them needs to pick a white guy from a swing state, preferably a guy who owns a gun. [AUDIENCE LAUGHTER] And, I mean, seriously. I mean, that's what they need. That's where the problem is. And so I, you know, I would be very surprised to see that ticket. I don't think it's the ticket that would really work for them.